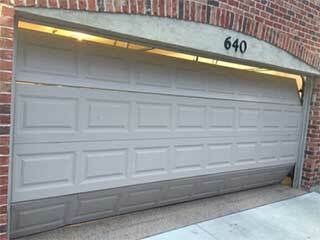 Has your garage door recently stopped working? Here are a few common issues you should consider as the source of the malfunction. Our experts will be happy to help you deal with them as well as with any other related problem. If your door continues to function when you use a different transmitter or your wall-mounted control panel, try replacing the batteries in your nonresponsive remote. Batteries can sometimes die out prematurely, and are often neglected to be considered as a possible culprit. It’s important your garage door tracks remain properly aligned, as they allow your door to move smoothly. If you notice gaps between your rollers and tracks, or if your door consistently slows down at a particular point of its motion, you might have an alignment problem. Misalignment can eventually cause your tracks to bend, which can potentially make your door collapse altogether. If you cannot detect any visual deformities about the track, listen for odd noises while the system operates. These sensors are an important safety mechanism that exists in every garage door model manufactured after 1993. Each photo-eye occupies the side of the bottom of your tracks. They operate by sending an invisible beam across the door's threshold. When that beam gets disrupted by a person or an object, the door will stop closing and will in fact reverse its action. You may need to clean or realign the photo eyes to allow your system to function properly again. Still Unable To Find The Problem? If you are still struggling to detect the cause of your issue, contact our team at Garage Door Repair Los Angeles, CA for assistance. We're highly experienced in spring adjustment, both torsion and extension types. We can also help you with any opener repair and replacement services you might require, as well as panel realignment and emergency repairs.